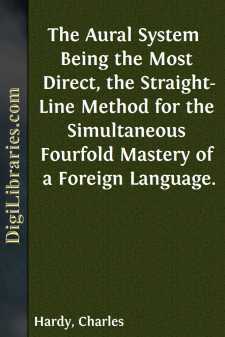 The Aural System Being the Most Direct, the Straight-Line Method for the Simultaneous Fourfold Mastery of a Foreign Language. Some time ago, a Mr. Wm. Rodger came down from Glasgow for the purpose of showing how foreign languages should be taught. He brought on a gentleman, a clergyman from Leeds, who had gone through Otto’s German Grammar without being able either to speak or understand German; this gentleman was able to bear testimony to the merit of Mr. Rodger’s system because by it he had learnt to do both. Of course his testimony rested on one assumption. It assumed that having gone through Otto’s Grammar all learnt from it had been forgotten, and that the whole merit of his success was due to Mr. Rodger’s method. Mr. Rodger was of opinion, that foreign languages should be learnt as a child learns its mother tongue. It seemed to me a strange use to make of the reason and intelligence of the adult, to cast it aside as useless and to ask the youth and man to become a child again. It appeared to me the most wasteful of methods. Is language a science, and if so, what would be thought of a similar proposal for acquiring any other science? But are the cases parallel? Is there any similarity of circumstance? Can the youth and man again place themselves in the circumstances of the child? The child is constantly hearing the language spoken, everyone around it is teaching it to speak, everything around it stimulates it to do so. Nearly everything it learns, comes to it through its mother tongue; at play it hears, it speaks. At five years of age it begins to go to school, and from that time until its fourteenth or sixteenth year, whatever else it studies, it must study its mother tongue. All other knowledge reaches it through this medium. Every other study compels the study and practice of its mother tongue and allowing ten hours per day for sleep, by the time it is fourteen years of age seventy-one thousand six hundred hours have been spent in such study and practice. Let us take the case of the youth or man who commences the study of a foreign language. He has found that a foreign language will be of use to him or has become necessary to him in his work. He begins to study it and takes the usual one lesson per week of one hour’s duration. In a year he has spent fifty hours with the teacher; if he devoted two or three hours weekly to the preparation of each lesson, he will have spent 150 to 200 hours per annum upon it, or, less absences and omissions, perhaps 140 or 180 hours upon its study. This makes fourteen days of ten hours or perhaps three weeks as against fourteen years spent by the child upon its mother tongue. Multiply this amount of fourteen days by two or three, and grammar is still seen by comparison to have accomplished a stupendous miracle. But even this disparity is not complete, for whilst the child, whether at work or play, never ceases to study and practice its native language, and this is by far its principal occupation, the youth and man, on the other hand, devote to the study of a foreign language, the remnants, the odds and ends of their time, after having exhausted their energies in their work. These were the considerations that occurred to me on thinking over Mr. Rodger’s prospectus. Nevertheless, it was impossible to regard as satisfactory a method of tuition or study, which left the pupil unable to understand or speak a language after having gone through a grammar like that of Otto. The Grammatical Method being one which does not seek to render easy and simple at the cost of efficiency, by eluding and evading the difficulties and peculiarities of a language, but being the one which fairly meets and masters them: there can be no question of dispensing with its valuable assistance. The wise course is to adopt that method of using it, which will enable us to derive most benefit from its teachings, and ensure success. It is for this purpose the following has been written. It follows from this, that if the pupil’s time admit, the most complete Grammar is the best. We have been amongst the most backward in this branch of study, but our grammars since then have been largely borrowed from our more successful competitors; from those who excelled as much in modern languages as we ourselves in industry. They are in many instances the work of foreign specialists and experts, they are the very instruments of success used by our most successful rivals, how then can they be inadequate? Translation has put us into possession of the best works used by our foreign rivals, and if we are less successful than they, it is due, as a Swiss correspondent of the “Manchester Guardian” recently stated, not to the superior aptitude, but to the superior application of the foreigner. The writer first commenced studying foreign languages nearly forty years ago, and has resided for nearly twenty years in various foreign countries. His experience with regard to those who learn foreign languages has been that those who commence the practice of a foreign language with a previous knowledge of its Grammar, learn to speak it with an ease, confidence and correctness never attained by those who try to dispense with such preparation and study. On the other hand those who have learnt to speak without such study, contract vicious and faulty locutions, and rarely if ever make good the deficiency. They are compelled of course to form a rough Grammar of their own, upon incomplete information, and have to do so hastily and imperfectly. For writing, where precision and accuracy are required a knowledge not based upon Grammar is next to worthless.